HR professional’s top priorities for 2018 include recruitment, health and wellbeing, and data protection, according to a new survey by CIPHR of 148 UK HR professionals. Top of the HR agenda for the coming year is data protection and the General Data Protection Regulation (GDPR), which was cited by 89% of respondents. Health and wellbeing, and recruitment, were each named as a concern by 56% of respondents. Performance management and appraisals (53%) and pay and benefits (50%) rounded out the top five HR priorities for 2018. The research, which forms part of a new CIPHR white paper, From evidence to automation: eight trends that’ll shape the HR profession in 2018, suggests only a slight shift in HR’s agenda for 2018 compared with the previous year. Survey respondents said their focus areas for 2017 recruitment, and data protection and the GDPR (each cited by 63% of respondents); health and wellbeing (55%); apprenticeships, and pay and benefits (both cited by 50% of respondents. Although gender pay gap reports have to be published for the first time this year, only a third (33%) of HR professionals surveyed said this was one of their top focus areas for 2018. Even fewer (29%) said they expected diversity and inclusion to be a key priority. 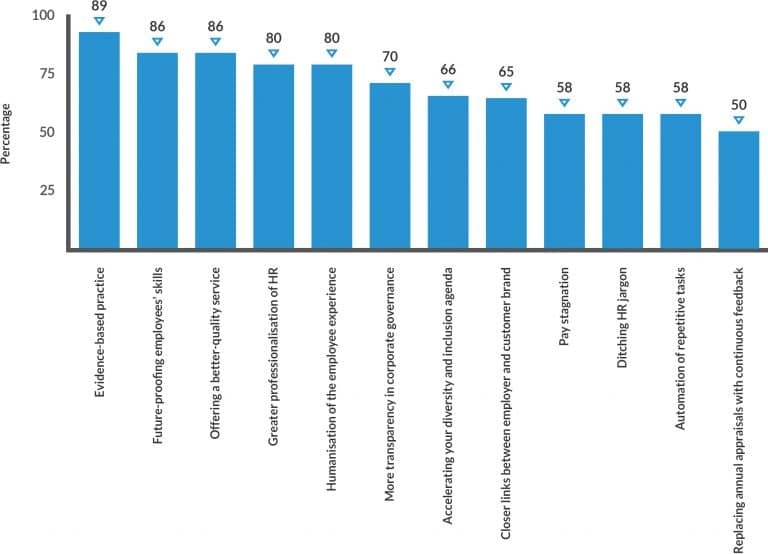 The survey also asked HR professionals what factors most influenced their strategies. The vast majority (98%) said that internal factors – such as senior leaders’ priorities, business goals, and employee feedback – influenced their strategy ‘to some extent’ or ‘a lot’. Less crucial were external factors (such as government policy, employment law, and the economy), which 52% said influenced their strategy ‘to some extent’, and 40% said it influenced them ‘a lot’. So-called HR thought-leaders might be concerned to hear that the most irrelevant factor was HR trends: just 7% said they were influenced ‘a lot’ by trends, while 34% said their plans were ‘not at all’ or ‘not a lot’ affected by HR thought leadership. 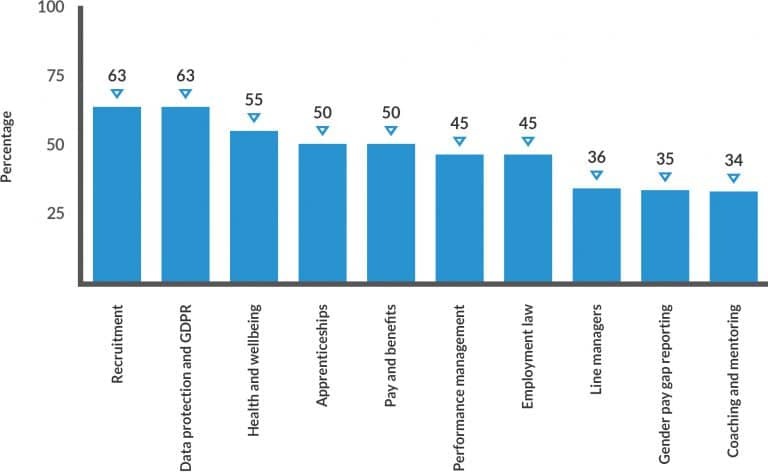 When asked to assess how influential 13 specified trends would be on their HR strategy in 2018, respondents said the ones most likely to affect them ‘a lot’ in the next 12 months were offering a better-quality HR service to internal customers (41%); using evidence to demonstrate the worth of HR strategies (35%); future-proofing employees’ skills (35%), and the humanisation of the employee experience (32%). The new white paper from CIPHR features analysis of eight key HR trends from experts including professor Dave Ulrich, former BBC HR director Lucy Adams, and David D’Souza from the CIPD.